If you are working in an organization as an FMW Administrator then you should know about Enterprise Deployment Architecture as it considers various business service level agreements (SLA) to make high-availability best practices and security technologies for Oracle Fusion Middleware. Visit: https://k21academy.com/fmw20 to learn more about Enterprise Deployment Architecture. Do you want to know about Oracle Fusion Middleware Architecture? 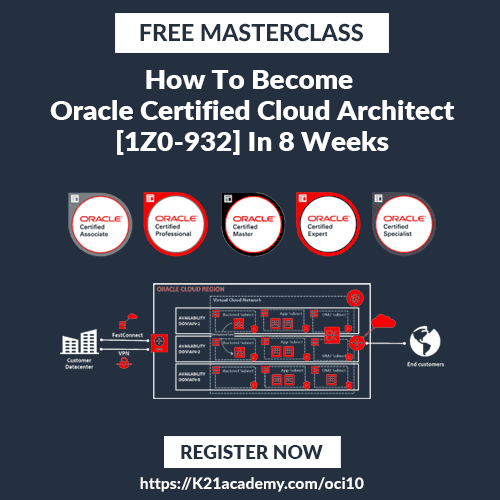 [BLOG] Oracle Fusion Middleware: 3 Tier Architecture Overview [Part II] Visit: https://k21academy.com/fmw19 & learn about the 3 tiers of FMW. Are you a beginner who has just started to learn Oracle Fusion Middleware? [VLOG] Oracle Fusion Middleware: Overview & System VS Java Components Visit: https://k21academy.com/fmw18 to learn about What is Oracle Fusion Middleware & one of the most common concepts i.e. Java & System Components.